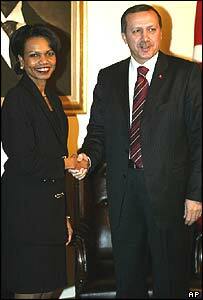 Condoleezza Rice has told leaders in Turkey that the US is "fully committed" to achieving a "unified Iraq". The new US secretary of state was in Ankara on the fourth leg of a tour of Europe and the Middle East. Turkey fears Kurds in Iraq are vying for political authority and that the Iraq war may lead to the creation of a Kurdish state in the north. Turkish Prime Minister Recep Tayyip Erdogan said relations with the US were at a "positive and mature point". During the flight to Ankara from Poland, Ms Rice told reporters: "I'm here really in part to say to the Turks that we are fully committed, fully committed, to a unified Iraq." The BBC's Pam O'Toole said relations cooled recently over what Turkey sees as Washington's failure to curb Iraqi Kurdish political ambitions, particularly in the oil-rich and ethnically-mixed northern city of Kirkuk. The Kurds are pressing for the creation of a Kurdish region in Iraq, with Kirkuk as its capital - even though it currently lies outside the area they control. 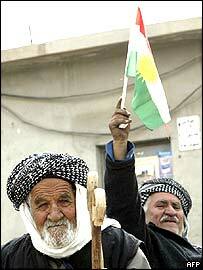 It has resulted in a war of words between Iraqi Kurdish leaders and Turkey's government. In recent weeks a ruling allowed around 70,000 Kurds who returned to the region - after being evicted under Saddam Hussein's Arabisation campaign - to vote in provincial elections. Kurds, who in northern Iraq make up 15% of the national population of 27 million, voted almost unanimously in an informal referendum for independence from Iraq. The unmonitored poll was conducted during last weekend's official Iraq elections, with Kurds surveyed as they emerged from polling stations. Some 95% supported independence, organisers said. Turkey has warned that it could take action if Iraqi Kurdish attempts to change the demography of Kirkuk lead to ethnic clashes. Kurds turned out in their hundreds to vote in Iraq's election, hoping that the proportional representation system would win a bloc of seats for Kurdistan in the new government in Baghdad. It meant doing away with rivalry for the main Kurdish parties - the Kurdistan Democratic Party (KDP) and the Patriotic Union of Kurdistan (PUK) who formed a United Kurdistan Coalition with Turcoman, Assyrian, Islamic and other parties. The election result is expected later this week. Ms Rice's eight-day tour is focusing on European ties and the prospects for peace in the Middle East. While in Turkey, she met Russian Foreign Minister Sergey Lavrov for a working dinner. On Sunday she heads to Israel.